And suddenly it’s August! 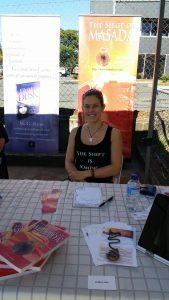 I was away in Perth the first week of July, furiously editing Transylvanian Knight (read my blog post about editing), and the rest of last month was full of writing events! 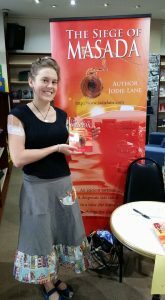 The North Lakes Dymocks Book Signing was interesting and fun, and the very next day I had a well-attended and successful Author Talk at Chermside Library. Met some lovely writers, readers and travellers, and I’m very appreciative of Brisbane Libraries for hosting me. I took part in the Digital Author Pop recording for Sunshine Coast Libraries, where they filmed me talking about Masada. Can’t wait to see the video. And finally, the InHouse Publishing Author Day was on at Underwood! A great day, listening to some inspirational speakers and meeting lots of other authors. 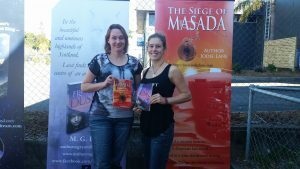 I picked up a few works by other writers and got to share some of my experience publishing with InHouse, plus it was great meeting the staff who make a book come to life.